Well..more than sometimes actually, but that is not the point. The point is…if you enthusiastically tell your trainer that one of your new long term goals is to do a hand stand press up you shouldn’t be too surprised if you start getting given exercises that work towards said handstand press up! Actually I think this is pretty awesome…and I would be practising attempting handstands already if I didn’t have a fear of falling on my head in a gym full of people! 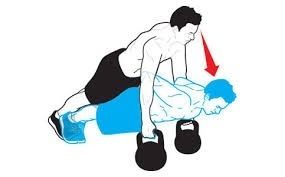 30s plank with hands on kettlebells. Then came the step towards handstand press ups…I had to do pike press ups! We worked on one giant combination this time, which Matt kept adding stuff to the end of to the point that it was amazing that both of us remembered it! Yes…it was as tiring as it sounds…but it was excellent and so much fun and it was really fast once we got going 😀 and we did get going, and we did it enough times that we finally remembered it! There was then core work…with a cable machine…and holding steady while the machine was trying to pull me sideways…it is surprisingly effective! Well…ok…no I didn’t I did some stretching and went home but collapsing was definitely on the cards! Previous Challenge 5: One does not simply walk into Mordor! One-armed planks??? I am giving you a standing ovation for that one! BRAVO! You are a beast!! I’m still wincing from my second BodyPump in 3 days. I did the 45 min class again today. My chest and upper back are still screaming! Eventually my body will remember what it’s supposed to do. Til then…PAIN! I think I keep my muscles guessing so much by swapping what I do that they forget to ache much before they are hit with the next thing…apart from dead lifts, they got me!